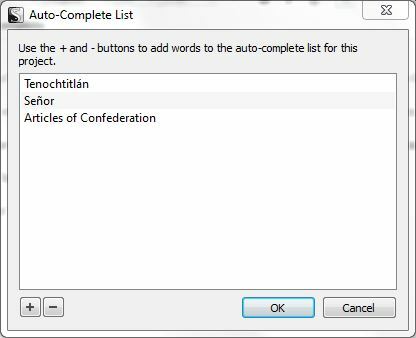 I stumbled across the Auto-Complete function the other day when I was doing a menu-crawl around Scrivener’s nooks and crannies. It’s not the same as Auto-Correct, which I’ve had to turn off. Either Auto-Correct is too imaginative or I am: when I had the feature turned on, Scrivener kept changing my characters’ names and “correcting” other words that I didn’t notice until I reread my pages. Or worse, until I read them to my critique group. Auto-Complete, on the other hand, only does what you’ve told it to do, offering up long or difficult-to-type words or phrases when you type the first letter. For novelists, I imagine this would most often be character or place names. In my collection of unpublished novels, I have a parallel worlds tale set partially along a Texas Coast dominated by the Aztec Empire. Tenochtitlán popped up from time to time, and I was glad to have whatever word processor I was using at the time let me assign a short-cut key to it. And the words Señor and Señora, with their tildes, were all over the manuscript. Scrivener allows you to set up a separate Auto-Complete list for each project (under the Project menu, or with ctrl+shift+4). When you type the first letter of one of the words or phrases on your list, up it pops in an unobtrusive little box. If that’s what you want, hit enter. If not, just keep typing, and chances are you won’t even notice the pop up. Say you’re working on an essay on American history—just how many times do you want to spell out Articles of Confederation? I didn’t find much on Auto-Complete in the Scrivener documentation, so it took a little experimentation to make it work. You enter the words you want to escape retyping in the Auto-Complete list box (to get the accent on Tenochtitlán and the tilde on Señor I typed them in my text, using the Character Map located at the bottom of the Edit menu to find my special letters, and then copied and pasted them into the list box). But you also have to go to the Corrections section of the Options box (under the Tools menu) and make sure that “suggest completions as you type” is checked. You may never have to look up that pesky accent or umlaut again. Thanks for that, i would never have found it without you! Thanks for visiting. Glad to help. I haven’t been using Auto-Complete, so I had to go experiment with it, and I’m afraid I couldn’t get it to do italics, either. I tried pasting a phrase in italics into the Auto-Complete box, but that didn’t work. I think you just have to use the italics icon. You might find a solution on the Scrivener forums, though (http://www.literatureandlatte.com/forum/). 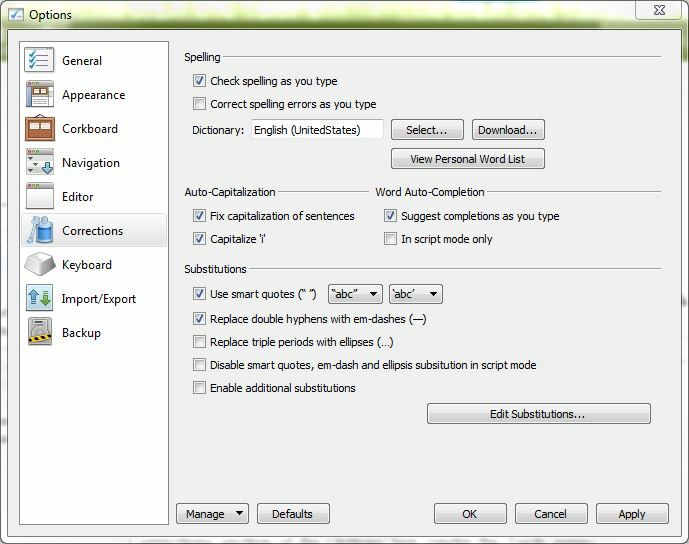 This is a great article, Kay, as I am very new to Scrivener and still struggling a bit. QQ: You referenced the “Tools menu | Options box” and I’m having trouble locating these. If you wouldn’t mind, what is the complete path? Thank you. (I’m using version 2.5, if that helps). Magda, if you’re using Version 2.5, you must be on a Mac; the current Windows version is 1.6. The path in Windows is Tools/Options/Corrections to turn the feature on, but for the actual list, you go to Project/Auto-Complete List. Two separate menus! I can’t find Auto-Complete in the index of Scrivener For Dummies, but it’s probably similar in the Mac version. If you still have trouble finding what you need, you might try the forums on the Literature and Latte site–there’s an enormous amount of information there. Thanks, Kay. Yes – I am using a Mac, and that explains the difference. I was able to find the Auto-complete feature but could not locate the Tools | Options | Corrections. I will do further digging but thanks for your assistance. Thank you, Kay. Really helpful. Thank you for this. I just downloaded Scrivener and fumbled around. I like it so far, but auto correct is a must-have deal breaker for me. It took me some trial and error. You have to check that little box that says “enable additional substitutions.” Yay!! Autocorrect!! Glad to help! Autocomplete is definitely a benefit for invented or foreign names. Thanks to you article if figured out how to make autocomplete do ever thing I want it to do except, the word autocomplete suggests is highlighted in a bright orange color with white letters. That makes it very diffucult for me to read. Can I change the highlight color or better just eliminate it? I’m glad this was helpful. I’m afraid I couldn’t recreate your problem–when I use Auto-Complete, the suggested word comes up black on white in a little box. I don’t see anything to do with highlighting in the Auto-Complete box. I figured it out. The color of the highlight is a Mac OS function, not a Scrivener one. Go to System preferences> general> highlight color: then pick blue. The top first choice autocomplete words will now be displayed in an easy to read white font on a blue background. Blue is actually the default color. Aha! Good for you. I work on a PC, which explains why I didn’t understand a Mac problem. I’m glad you figured it out. Thanks for your post! New to Scrivener and was concerned about losing this feature! So glad you found it helpful, Mark!